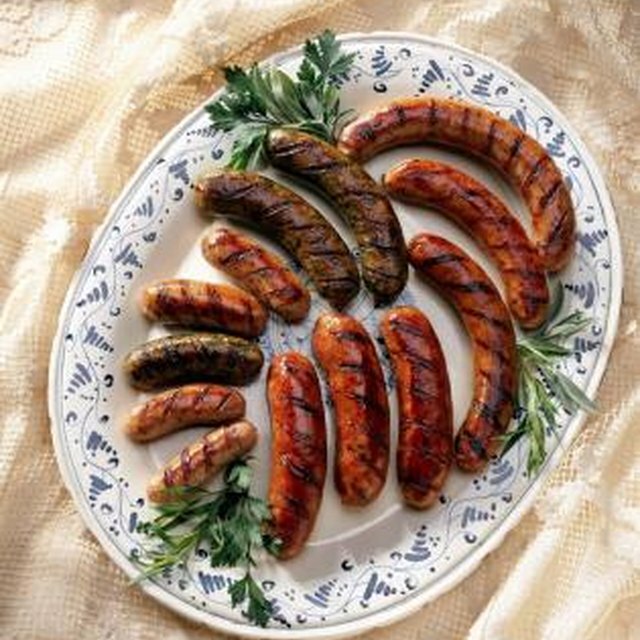 Deer brats are not easily found in the grocery store like traditional bratwurst. Instead, you can purchase deer brats from a deer farm or have your local butcher process your harvested venison. Deer meat is very lean, which results in most brats having added pork for extra flavor and moisture. Despite the added pork, cooking deer brats requires a specific approach to prevent dry, tough meat. Melt 1/2-stick of butter in the skillet. Place the brats in the skillet, turning occasionally to fry and brown all sides. Remove the brats from the skillet when cooked through with an internal temperature of 160 degrees Fahrenheit. Simmer water in a saucepan on the stove. Poach the brats in the simmering water for about 15 minutes. Remove the brats from the water and place them on the grill. Cook raw sausages for a total of about 15 minutes, turning occasionally to ensure even cooking. Combine with sauerkraut or slice to add to casseroles or baked dishes. Always use tongs while cooking deer brats to prevent piercing the outer skin. Do You Need to Boil Sausage Before Frying?